The Yaeyama islands make up the southernmost inhabited archipelago of Japan, some 2,000 kilometres (1,242 miles) from Tokyo. This group of untouched islands offer a total change of scenery in a subtropical climate. This is the ideal destination to unwind and experience the natural beauty of the Japanese jungle, unspoiled beaches and pristine reefs. Ishigaki is the most populated island of the archipelago and the transport hub, with daily flights to/from Kyoto and Tokyo airports. 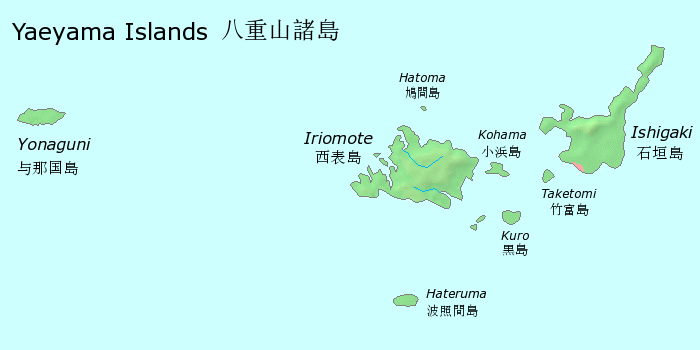 Iriomote is one of the largest islands, but least populated, with only 2,000 inhabitants. 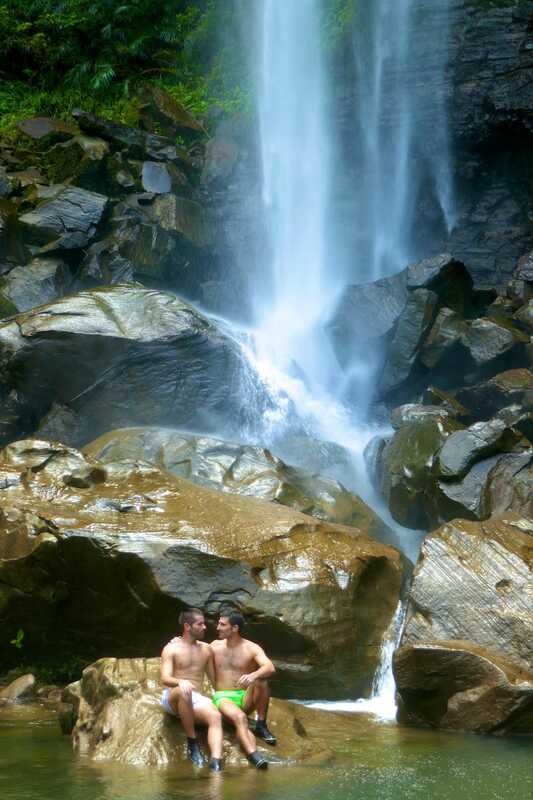 With 90% covered in dense jungle and mangrove swamps, Iriomote is an adventure sanctuary. Taketomi is one of the smaller islands, just 1km long, with stunning white sandy beaches and at its centre, a village which has maintained its traditional charm from the Ryukyu kingdom. In order to maximise your time in the Yaeyama islands, we advise spreading your stay between Ishigaki island for the first few days, then Iriomote for the remaining period so you can explore the surrounding rainforest. Ishigaki is the main island most tourists base themselves on because it is the most developed and the main transport hub into and out of the Yaeyama islands. As a result it is more crowded, but will have greater variety of cultural activities, like the Yaima Cultural Village and of course more dining options. Iriomote on the other hand is more remote, peaceful, with fewer tourists. Most come here as a day trip from Ishigaki and leave. Where you choose to base yourself comes down to whether you prefer being close to all the action or away from it all, closer to nature. We chose to split our time between the 2 to get the most out of each island. 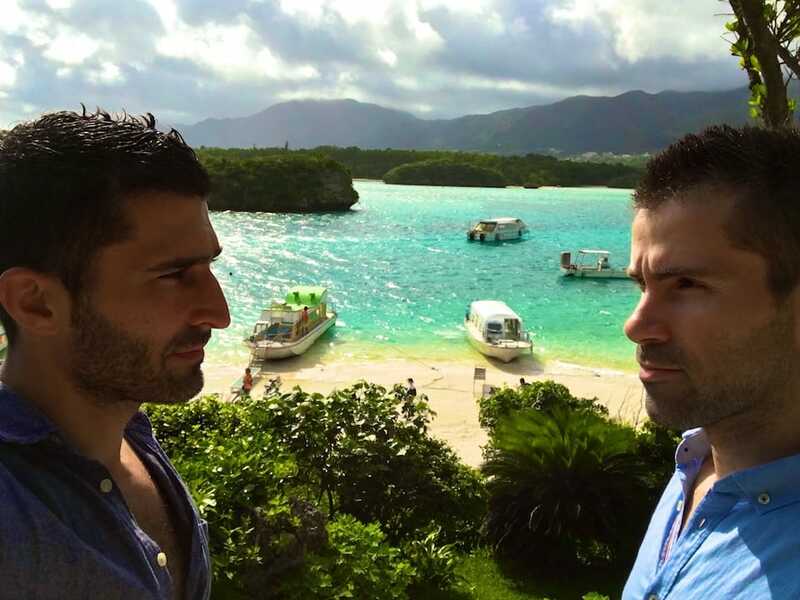 ANA Intercontinental Ishigaki Resort: popular with honeymooners and minutes walking distance to Maezato beach. ANA has a heated pool, public bath, fitness centre and spa for that all important holiday massage splurge. Note that if you are an IHG loyalty member, you get 20% off all food and drink. Rooms start from 24,000 yen ($230) a night. Ishigaki Seaside Hotel: a more affordable option close to Kabira Bay and with beach access. The bungalows have Jacuzzis on their private terrace, making it ideal for couples and an all round winner for us! The rooms in the main building all have sea facing views – this is a massive highlight because they are West facing, so expect some stunning #sunsetporn. 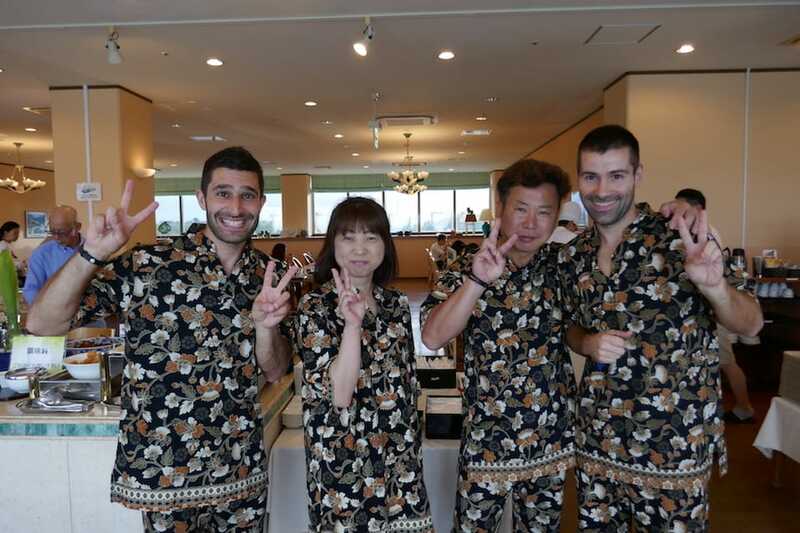 Our main highlights however from the Ishigaki Seaside Hotel were the tres chic matching pyjamas they offer all guests. Rooms start from 21,000 yen ($200) a night. Jungle Hotel Painu Maya: another hidden gem in the middle of the jungle. It’s remote, so don’t come expecting the fastest Wi-Fi, ATMs or variety of dining options. Just 1 place to eat…all part of the joy of being remote and away from everything. It’s close to the beach and also has its own indoor and outdoor onsen. Rooms start from 17,750 ($170) a night. Hotel Nirakanai Iriomote: has pristine, rubbish free beach where they do morning yoga classes. This is where celebrities are more likely to stay if visiting the island and we did spot a film crew during our stay here. Great beach to hang out at after a day of jungle trekking. Rooms start from 16,750 yen ($160) a night. The scuba diving in the Yaeyama islands is the best in the whole country and after our outstanding diving experience in the Komodo National Park, we were keen to get back into the underwater world. We recommend Prime Scuba Ishigaki Diving who have an established diving shop on Ishigaki island and speak English. Manta Rays Scramble: this is a cleaning station near Kabira Beach on Ishigaki. You’re almost guaranteed to spot Manta Rays from Spring to Autumn, particularly June to September. Baras Island: the coral around Baras island is ideal for diving and snorkelling. It’s worth spending at least a day just to explore the tropical world here. You can go on a day trip from either Ishigaki or Iriomote. Yonaguni Monument: this is a submerged rock formation, off the coast of Yonaguni island and considered Japan’s underwater “Pyramid”. Since its discovery in 1980s, it’s caused so much controversy because experts can’t determine if it’s natural or man made. Recent research suggests it could be the remains of an underwater city called Mu, dating back at least 5,000 years. Hammerhead sharks: Yonaguni also attracts its share of Hammerhead sharks, which can be spotted throughout the year, particularly between December to February. Try awamori: the unique type of sake (Japanese rice wine) from Okinawa. Unlike traditional sake from mainland Japan awamori is distilled not brewed. You can get it in most restaurants in the Yaeyama islands, served neat with ice and a glass of water to mix. Kabira Bay: attracts thousands of tourists every year who come to marvel at the turquoise waters promised by the guide books and (ahem!) blog posts you read online. Come here to hear cries of sugoi (amazing!) or kirei (beautiful!) by Japanese tourists also enjoying the views across the bay. Taketomi is a tiny inhabited island, just a few miles southwest of Ishigaki. There’s frequent ferries from Ishigaki, which only take 10-15 minutes so perfect for a fun day trip. 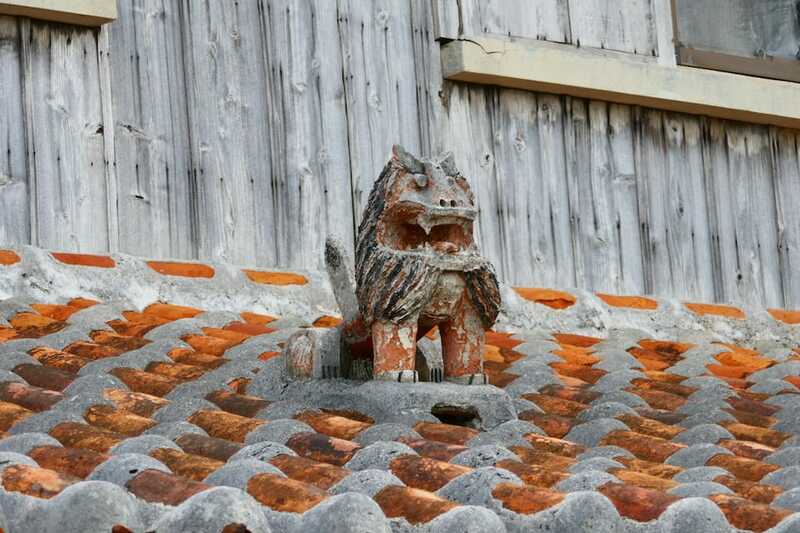 The village of Taketomi is crying out to be photographed, with traditional Ryukyu red-tiled one-story houses down the narrow lanes, each lined with white coral walls and the roofs decorated with traditional shiisaa good luck figurines. Cycling: Taketomi is small and flat, making it ideal for cycling. Bike rentals are widely available and it only takes a few hours to cycle around the entire island. Beaches: Taketomi has some impressive beaches, in particular Kaiji Beach, famous its tiny star shaped sand. Also check out Kondoi Beach which is much larger and ideal for lounging (and playing) in the sun. Iriomote is Japan’s jungle island and THE place to come for those seeking adventure. 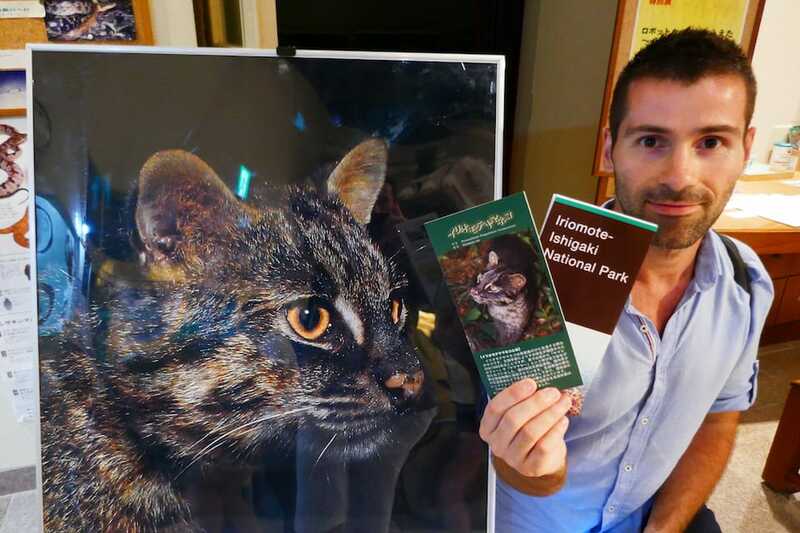 There’s more nature than people spread across this large island as well as an abundance of wildlife ranging from wild boars to the elusive Iriomote cat. In order to get the most out of your time on Iriomote, we recommend doing a tour with a reputable company like Iriomote Kayak Tour Service who have friendly and attentive English speaking guides. snorkelling and diving in the beautiful coral reef surrounding the island. beach time in some of the many coves and inlets, each hiding a deserted beach. kayaking in the tropical rivers, surrounded by mangroves. jungle trekking through the thick, dense jungle. To read more about our experiences in the Yaeyama islands, read our article for Mr Hudson Explores. To get into the Yaeyama islands, there are daily direct flights to Ishigaki from both Kyoto and Tokyo airports. For the best deals, we recommend checking on Skyscanner. To travel between islands, there are daily scheduled ferries to/from each island. Tickets can be bought on the day at the port terminal.